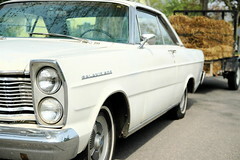 snowdeal.org > ex machina: haulin' straw with the galaxie. haulin' straw with the galaxie. i can say with some authority that nothing brings out the smiles and waves quite like when your tooling around the country roads of a farming community hauling a load of straw in an old ford. farmers like their old fords and i've discovered that they have a peculiar amount of respect for one with an original 289 under the hood.